Celia from Fig Jam And Lime Cordial has grown the in my kitchen contributors from a handful of us to somewhere around the 50 mark. I try and read each post every month as I just love taking a peek into everyone’s kitchens. I hope you enjoy this month’s peek in to mine! I was gifted a lot of grapefruit and other that the curd I made, I also made some grapefruit cordial. Before I could make the cordial I had to order a bottle. It was slightly smaller than I anticipated (I didn’t look to see how many mls it took!) but it is perfect for cordial. In the post where I mentioned my muslin Sherry recommended that I buy some Chux cloths. After entering the term into Google I realized that were the blue kitchen cloths that I use to clean my plates when taking photographs. I went out and bought a roll straight away. I have used one already to make ricotta and what a pleasure! I have cleaned the cloth, but I now know that if it turns out too messy I can just toss it. When testing a recipe from Lorraine’s cook book I made pork cheeks. The result of that was a lot of lard! I have already made some Yorkshire puddings with the lard – it is amazingly sweet. I have chosen to make my own bacon following on from my Mastering Meat course. 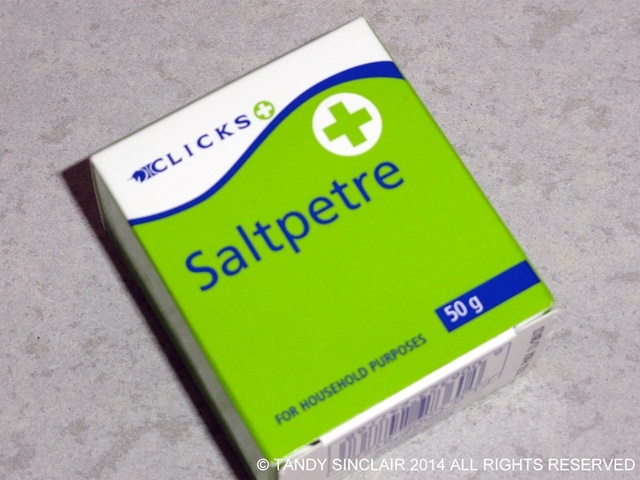 I had to find saltpetre for the recipe so the first step has been done. My parents came for their annual visit in June and brought with them my birthday present. Lucky me I could open it straight away! It is a lovely tea pot which came with 4 different flowering buds. Each one tasted the same 😉 I just love it and am using it for my herbal infusion teas as I can brew a pot at a time and leave it standing for 3 days, enjoying a cup a day. 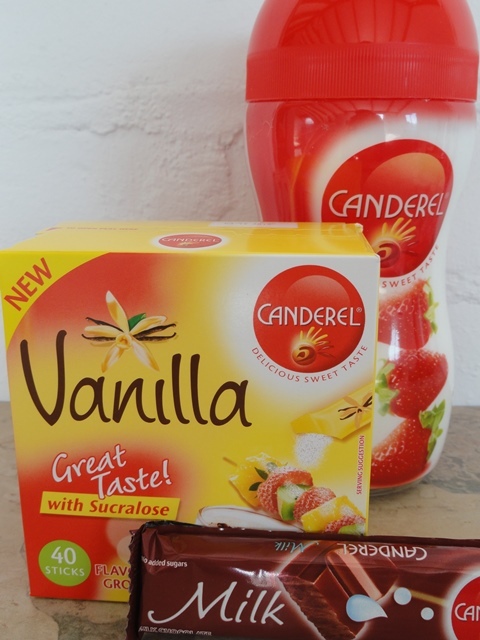 The new PR agency for Canderel have sent me a hamper to try out. I usually always have their chocolate at home as they are sugar free. I look forward to trying out the other products as I have only used Canderel Yellow to date. After the Knorr Function we were sent home with an amazing bag which I will take overseas with me for shopping. In the bag was a huge selection of goodies. I have given the sauces and cook in bags to my step son James and kept the stock pots for myself. The salad dressings are all at work as Dave has salad every day for lunch. James is most enthusiastic to try out all his products and it gives me great pleasure to spread the joy. 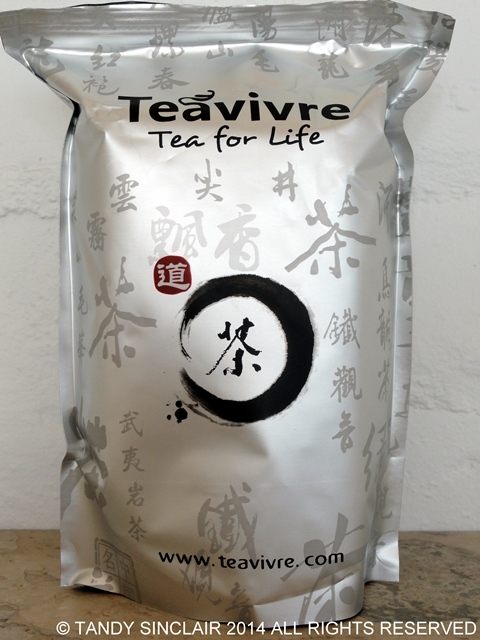 I have been sent a selection of Chinese teas from Teavivre. I have yet to try them as I am using up my oldest teas first. Once I have done so I shall let you know how they taste. After Germany won the world cup Checkers sent me a bottle of German Wine. They have a fantastic selection of international wines and I have been fortunate to taste quite a few. Ah, I love learning the names of the same things around the world! Thank you for the visit Liz, and you can come and live in my kitchen anytime! 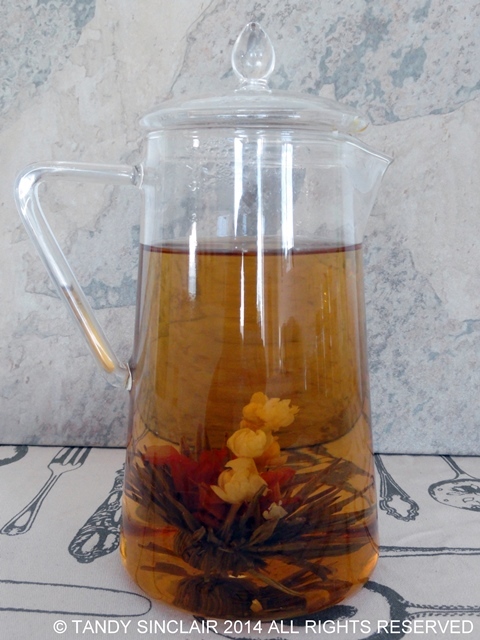 Hi Tandy, what a beautiful teapot and is perfect for a flower tea. Look forward to see your bacon. I love the tea infuser. Despite the heat here I still enjoy a hot tea now and then. Otherwise it’s sweet tea for me. The Chinese tea sounds wonderful as well and the cordial bottle is great. I have a stash of bottles as well, never know when I may need them! I too have just been given a large bucket of grapefruit and was wondering what to do with it. Thank you, I am going to make cordial now. Chux are so useful in the kitchen aren’t they. I love your lard. It is fantastic in pastry and flour tortillas. I await with interest your bacon adventures. I’m going to have to search for those chux towels. Those sounds really awesome! Let me know what they are called there please! Tandy, I was admiring your cordial bottle — such a ‘fluid’ shape! (No pun intended.) Your tea infuser is gorgeous, too. Funny there wasn’t any difference in flavors 😉 but it’s stunning to see the blossoms. Happy Birthday! I love Chinese tea too. Yours looks wonderful. What a great tea pot. 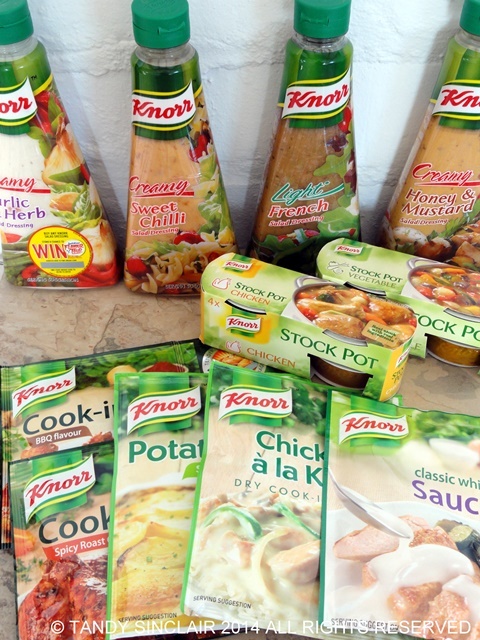 Those Knorr products look interesting too. Hope you enjoy my IMK post. Emma. Lots of goodies for sure! Ha ha! Chux – I use it all the time to make curd cheese and to strain things but of course, the name is obviously ‘local’. I have your recipe for Grapefruit Curd bookmarked as a friend gave us a huge batch which we managed to get through via juicing but now we have another batch! Cheers Tandy and thanks for your regular tweets too! 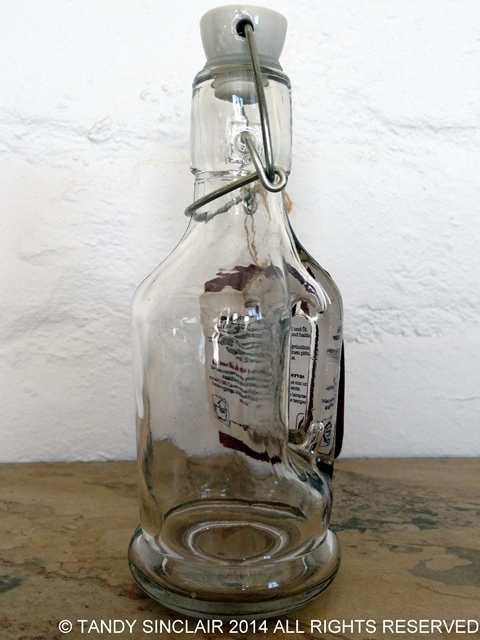 cute cordial bottle tandy. glad you found some Chux! they are so handy for all sorts of things. i use them to strain my limoncello each xmas when i make it. Wow, you have been send lots of lovely things recently, Tandy! I love the teapot, as well, and … Lorraine has a cook book? Got to check that one out! What a fabulously full IMK post Tandy. I love your teapot from your folks! I love that bottle! Will look great with the cordial in it. I’ve got a few pink grapefruit I’m awaiting to ripen, fingers crossed they will actually be pink! Your cordial bottle is so cute!! 🙂 We don’t really use many cute bottles for anything, we just reuse old glass bottles :/ I’ve always wanted to render lard since there’s a couple of recipes I’ve always wanted to make which uses it, but have been sort of put off by the fact that it’s pretty unhealthy haha. Love how you label your jars- I bet your kitchen is super neat and tidy! 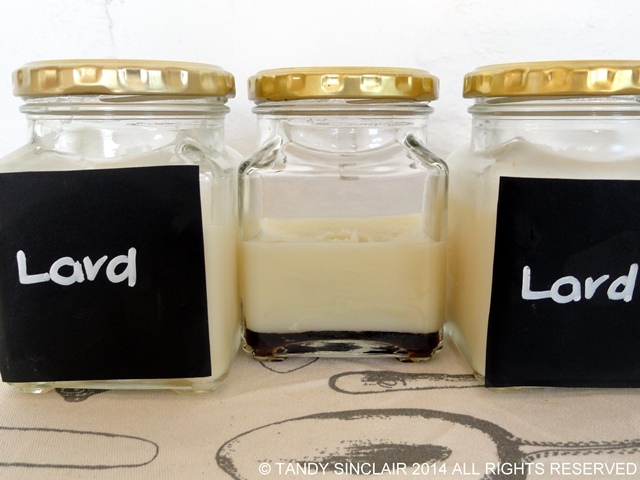 wow, that a lot of lard!!! goood luck with your meat curing project, i’m just finish curing my lamb pancetta…. I’ve always wanted to make my own bacon, but I haven’t worked up the effort to try it yet. I look forward to seeing how yours turns out. Thanks for the tour Tandy. Those chux wipes are so useful for straining all sorts of things- making Labne, jellis ( in smaller quantities, straining anything really. 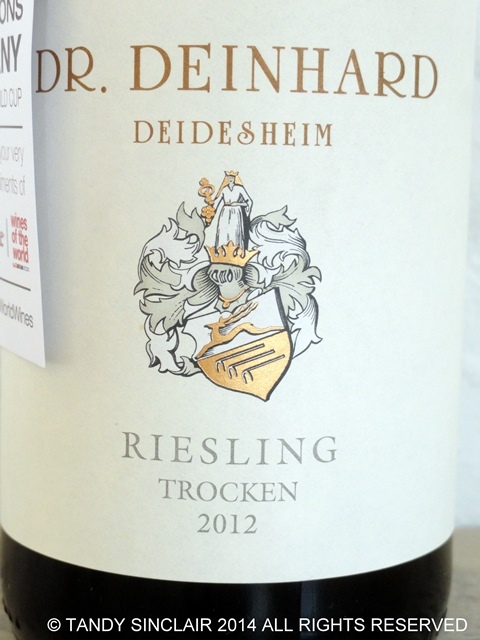 Nothing like a good bottle of German Rielsing- nice gift. Yes, I love looking into other peoples kitchen too, Tandy – yours is always interesting – such a pretty teapot and no doubt as you have found out the chux work really well in place of muslin. Looking forward to joining this when I have a more permanent kitchen, but that is still a few months away! Hi Tandy, you have a lot of great things in your kitchen this month, love the tea pot your parents brought you. Love the peek into your kitchen! I love your teapot. Beautiful! G’day! Fun post today Tandy and it brightened my day! I shall have to Google that Joanne! 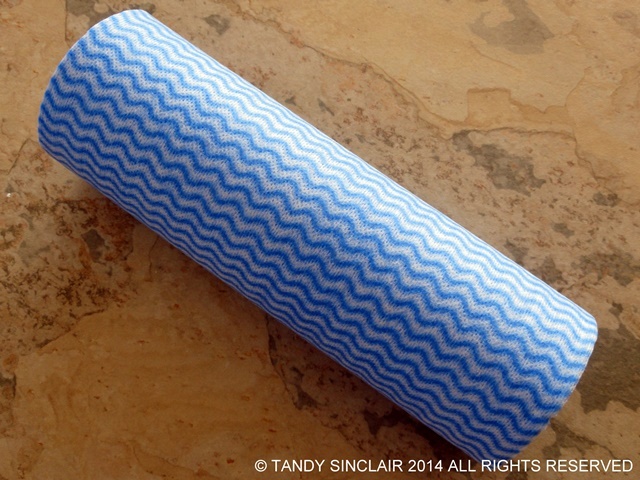 Hi Tandy, lots of good things happening at your place! Love the lard!